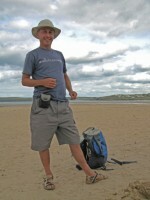 Paul Simmons lives around Penryn in Cornwall. Home (with a small "h") is just a place to sleep whereas the paths and landscape of Cornwall are really Home (with the big "H"). Hi, I'm Paul. I have an office at the Tremough Innovation Centre at the University of Exeter Tremough Campus at Penryn. I also have the South West Mountain and Moorland Camping Leader award recognised by the British Mountain Council and MLTE (Mountain Leaders Training England) and I'm qualified to go "wild camping” on the Moors. I am fully insured to take walks on the Moors and all paths in the South West. I was a committee member of the South West Coast Path Association representing the Lizard from Porthleven to Falmouth and over to the Roseland peninsula and up to Mevagissey. 80 miles (128 km) of fabulous coast path. 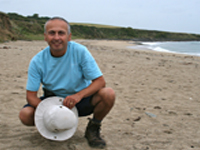 I've been a qualified Green Guide since 2001 and presently I am an ambassador for CoaST (Sustainable Tourism network), for Cornwall 365 and for the World Heritage Network. In 2008 I completed an MA in Cornish Studies at the Institute of Cornish Studies which involves cultural, historic, social, political and economic studies. My dissertation is about the public and professional attitudes to the conservation of the biodiversity on the Lizard. I also have a National Certificate in Practical Habitat Management from Merrist Wood College Surrey. I take tours twice a week when not walking around the Lizard peninsula and all places far west for the Clowance Estate guests all year round in his trusty VW 9 seater named Ellie by the children. 6 hours of not having to drive for everybody else and we get to the backwaters and under the skin of the places we explore. I've worked for the Wildfowl and Wetlands Trust at the Wetland Centre, Barnes London on their 105 acre as an explainer in the education department setting up and co ordinating various educational programmes. Pond dipping and inaugurating an Earth time line are favourites. I am absilutely passionate about Environmental Education because for the next generations if they don't know what is out there they will not care about it and it will be lost. So I'm looking to get funding to roll out programmes to be shown/ shared and taught in schools. I'm also a singer songwriter and have a new album out February 2017. I have been a professional piano entertainer and session player for 32 years. "From Cole Porter to Coldplay, Gershwin to Green Day". I still play and sing in Cornwall providing the entertainment at many venues in the evening.